Mike Reynolds (blog/Twitter) is an Ottawa born-and-raised husband and father to two beautiful girls. He’s obsessed with making sure his daughter says ‘daddy and mommy’ and not ‘mommy and daddy’ and with finding junk he thinks will one day be considered an antique. He also blogs about his admitted cluelessness when it comes to raising children.When you have the chance to live in a small village, you quickly come to realize there aren’t many places that define that village better than its curling club.The Metcalfe Curling Club, located, not surprisingly, in my small hometown of Metcalfe which is but a stone’s throw away from downtown Ottawa, epitomizes small town curling. Hundreds of members flock there every week to play in one of the many leagues the club offers: the men’s league, the woman’s league, the mixed league, the ‘competitive’ fixed league or, most social of all, the weekend bonspiel.No matter what league though, the basic tenets of curling all apply – be relatively kind to one another, listen to your skip when they’re talking to you (but when they look away do what you want), and be sure to buy one another drinks when the game is done. Like small towns themselves, curling clubs are steeped in history, and on February 17 and 18, the Metcalfe Curling Club honoured these traditions with the 13th annual Then and Now bonspiel. What sets this event apart from the myriad of other bonspiels that dot Metcalfe’s weekend calendar is that for the Then and Now, half of each game is played outside, much like it would have been a hundred years ago. 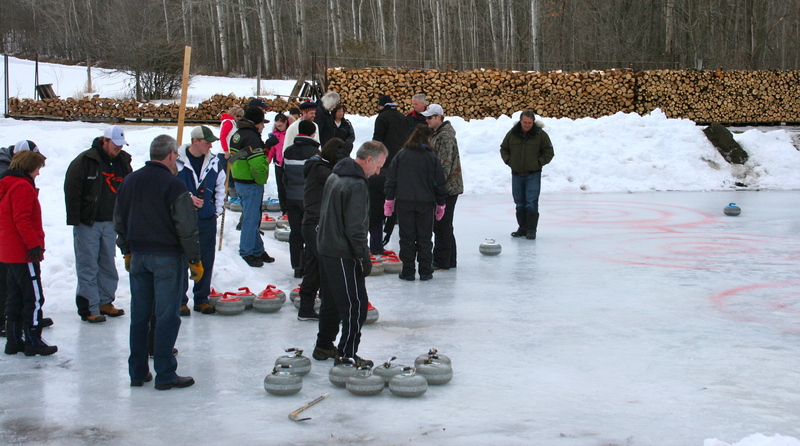 This was the fourth time I had participated in the spiel, which is made up of teams with curlers and non-curlers alike. He said all this while holding a can of beer in hand. A not-quite-as-lopsided experience occurred in our own game, as our more experienced indoor curling team muddled our way to a tie. Highlights of the outdoor portion included colourful, old fashioned curling outfits and equipment, me ripping a massive hole in my completely inappropriate skinny jean pants, a rock being thrown three feet past the rings (causing it to be sent almost to the bottom of the pond), and watching each team carry around their custom packed coolers to ensure the traditional sharing of the drinks could take place outdoors. The inside game was a little more traditional and therefore a little less highlight filled. Although we came away with the victory, the memories of the night were unquestionably the outdoor curling and the indoor, post-game chilli. The chilli has long been a post-game tradition for the Then and Now spiel, and each year I’ve challenged myself to eat multiple bowls of the hottest variety offered. Armed with a tall glass of Keith’s Dark brew, I successfully took down my two bowls, even if the heat was apparently showing a bit. “I think it’s just the wool of the curling sweater. 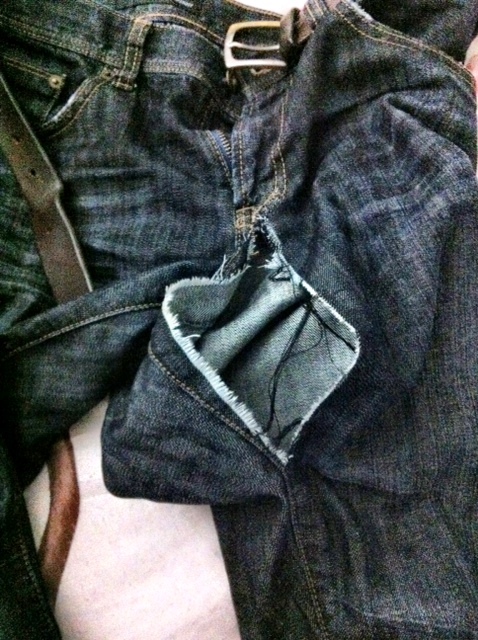 It must have come from a Northern sheep. maybe an Alaskan one,” I said back. Nevertheless, I survived the chilli, made it home for the night and started resting up for day number two. The next day, we again started our game on the “Then” sheet of ice which had improved slightly overnight thanks to the -5 temperatures. For us, the outdoor part was a family affair, with my brother, dad and friend playing on my team and with my mother, wife and two kids (including my 17-day-old daughter) coming to watch and, more importantly, eat s’mores by the fire at the pond. 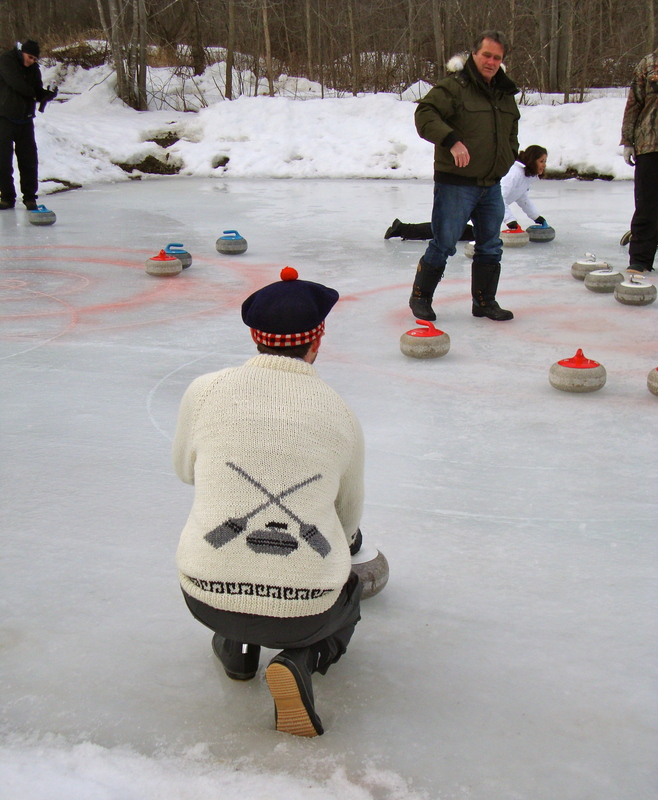 Wearing an outfit that included my custom made curling sweater, a vintage curling tam and a pair of pants much more conducive to bending over, we stormed to an early lead, taking advantage of the lack of water covering our playing surface. Both the team and the kids came away from the Then part feeling pretty good – the team because of the early lead and the kids because of the six or seven pounds of chocolate and marshmallow they had ingested. “Daddy, I had chocolate,” Leah tried to explain to me after my game, as though the layer of chocolate all over her face wouldn’t have given me a big enough clue. “I burned marshmallows in the fire too,” she said again, making sure I didn’t assume anything about what appeared to be a pair of squishy, sticky white gloves covering her hands. The second half, or the “Now part,” of our game, went just as well. We came away with a victory in our second and last game of the spiel, meaning we’d get a pretty early crack at the prize table. But the prize table is a secondary perk of the Then and Now spiel. Dinner, this time, was the real must-have moment of the night. Each team was assigned a dish, be it casserole, a salad, a dessert etc. to bring to the potluck feast, meaning most teams came armed with their specialty dish. 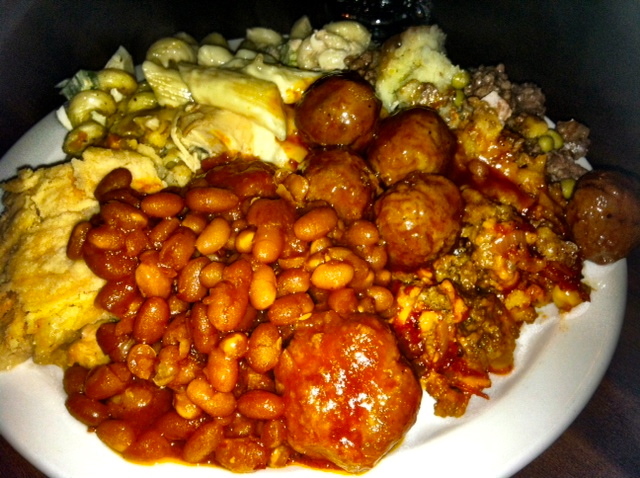 I got to eat six or four or five varieties of meatballs, pasta salad, fried beans and cheesecakes. A true veteran of the curling potluck, the buns went in my pockets, the salads were piled one on top of the other and the plate was only considered full when meatballs started falling onto the floor. Needless to say, come speech and prize time, the majority of us curlers had unbuttoned our pants (easier for me since I was already working with a ripped pair of jeans) and watered our stomachs with some draft beer. Prizes ranged from iPod speakers to dinner and a movie packages to garden gnomes – a little better than the typical weekend spiel. We said our thanks and picked our prizes (mine being the dinner and a movie package) and got ready to get back home to the children, very satisfied with our tied-for-third-place showing. I would like to hat tip and raise a curling broom to the Cooper and Woods families for hosting yet another wonderful Then and Now spiel and for making sure those who wouldn’t normally feel comfortable playing against experienced curlers feel like they belonged and could return again next year. I know for sure that our team will be. If you’d like a once-in-a-lifetime curling experience of your own, you should check it out too. 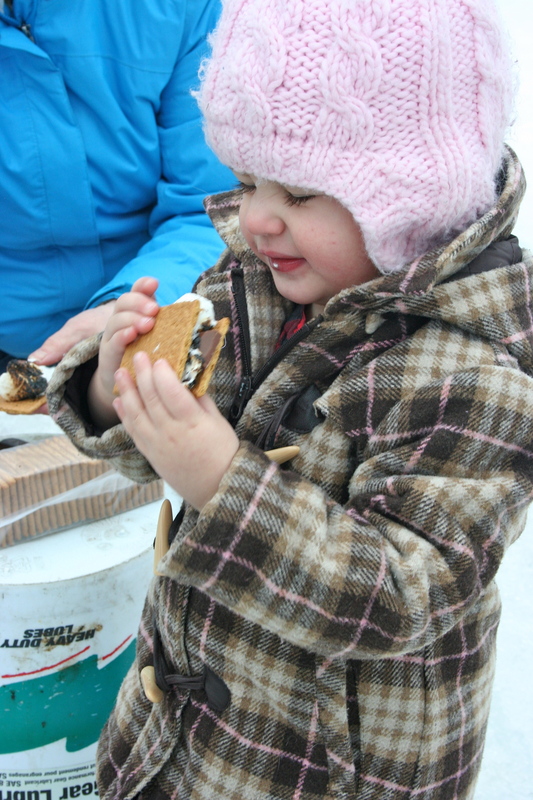 This post made us giggle and smile (and kicked off a killer craving for s’mores!). We’ll have to check this out next year! Have any of you ever participated in the “Then and Now” curling bonspiel? What’s your favourite curling memory? Excellent Mike, well written and very amusing to read!